The Warriors' Sam Tomkin at the AJ Hackett Nevis Highwire bungy, 134m above Queenstown. Herald readers recommended a bunch of great Kiwi activities for Warriors fullback Sam Tomkins. We sent him to see the best of Queenstown with competition winner Dave Floyd. "We had a five-course lunch at Amisfield restaurant and winery, and it was really something special. There were five great wines, selected to match each course and the service was exceptional. Prince William and Kate were out there earlier this year, and I can see what attracted them to the place." "This was seriously stunning. We stayed at the St Moritz and from our window, there were views right out across the lake and taking in the mountains all around. Absolutely first rate. We had a fabulous big bedroom and a great living area. It was right in the middle of town so it was a great base for our weekend and the staff were terrific." 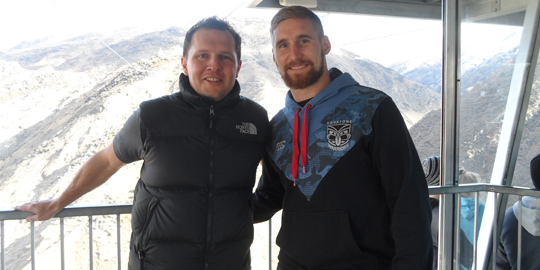 Herald competition winner Dave Floyd (left) with Sam Tomkins at the AJ Hackett Nevis Highwire bungy. "It was terrifying to stand there and look down into this huge canyon from so high up. And the exhilaration when you actually jump is just amazing. I've never done anything like it before. The AJ Hackett staff were terrific, they saw that I enjoyed the first jump so much and they immediately suggested I do another. I did, and it's definitely easier second time around." "What a place. Queenstown was fantastic. There can't be many towns in the world like it. It's a got a great exciting vibe, with so many young travellers from all around the world there for a great time. I was surprised how many league fans there were down there. I was getting recognised all around the place."